This article focuses on one of the most ground-breaking technological attempts to create a novel immersive media environment for a heightened televisual user experience: 3DTV, a Network of Excellence project that was funded by the European Commission 6th Framework Information Society Technologies Programme. Based on the theoretical framework mainly outlined in the works of Jonathan Crary and Brian Winston, and on empirical data obtained from the author’s laboratory visit notes and discussions with 3DTV practitioners, this article explores the claimed novelty of 3DTV through a focus on the history of stereoscopic vision and addresses the inconsistency between the research project’s expected and actual results. Today, especially with the increase in academic and corporate research on three-dimensional interactive and immersive media environments, we are witnessing new technological developments within the various areas of data visualization and user interaction that promote immersion into media ecologies. It is not uncommon that such initiatives are accompanied by a plethora of unrealistic expectations raised by the popular press, and not only by the most sensationalist tabloid science and technology magazines but sometimes by the most respected and serious newspapers and academic journals as well. These technical innovations thus gain from being critically analysed from the perspective of media archaeology. As an approach that questions linear historical narratives, media archaeology invites us to examine “new media cultures through insights from past new media” and to focus on the “forgotten, the quirky, the non-obvious apparatuses, practices and inventions.”2 A number of brilliantly conducted media archaeology studies have already clearly demonstrated that we are not the “first generation to wonder at the rapid and extraordinary shifts in the dimension of the world and the human relationships it contains as a result of new forms of communication.”3 Thus, just as with the ability of an academic study on the 19th century early telegraph to provide a “fascinating perspective on the challenges, opportunities, and pitfalls of the Internet,”4 a media archaeological exploration of past communication techniques can guide scholars towards a better treatise on today’s technologies. This article focuses on an interesting example of a ‘new’ communication medium: 3DTV. 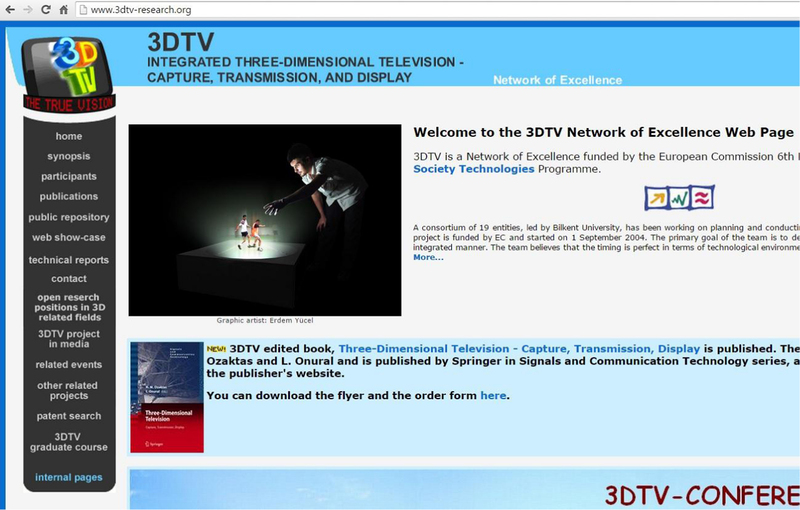 Envisioned as the one of the most ground-breaking technological attempts to create novel immersive media environments for heightened televisual and cinematic user experiences, and based on the human physiological foundation of stereoscopic vision, 3DTV was an academic Network of Excellence research consortium funded by the European Commission 6th Framework Information Society Technologies Programme. From the beginning of the consortium’s research, its attempts were enveloped with an aura of arguments claiming that 3DTV was destined to become television’s next revolution. Some of the claims went so far as to argue that this research would change our lives and habits forever because the “development will revolutionise the TV viewing experience because people will feel that they are not just watching the action but are actually in it.”5 Yet the actual project deliverables by the end of the funding period were much more modest in comparison with the mass-media-fuelled fantasies. Based on the theoretical framework that was mainly outlined in the works of Jonathan Crary and Brian Winston, the first part of this article explores the history of stereoscopic vision and related technological progress from the perspective of media archaeology. This historical introduction is included in order to better address the 3DTV project’s acclaimed revolutionary novelties. Enriched with the empirical data obtained from the author’s visit notes to Middle East Technical University’s (METU) 3DTV research laboratory and discussions with Turkish 3DTV researchers, the article’s second part addresses the discrepancies between the consortium’s expected and actual results. In 1838, Sir Charles Wheatstone invented a mirror device to deliver stereoscopic 3D images, which he called a stereoscope. This was one year before Daguerre announced that he had successfully reproduced scenes by a photographic process. In this way, the stereoscope even preceded photographic development.9 Jonathan Crary notes that the stereoscope is the “most significant form of visual imagery in the nineteenth century, with the exception of photographs,” and it is usually forgotten “how pervasive was the experience of the stereoscope and how for decades it defined a major mode of experiencing photographically produced images.”11 However, because the Wheatstone stereoscope was cumbersome and photography was still in its infancy, the initial optical device was not particularly successful commercially. The success and immense popularity of stereoscopes erupted after 1849, when, originally “urging for the stereoscope to be an enlightenment device for the teaching of geography, architecture and natural history,”12 David Brewster introduced a better elaborated device that in the end, “following refinement by Oliver Wendell Holmes went on to become the ubiquitous Victorian ‘parlor stereoscope’.”13 The technical and aesthetic refinements that Brewster applied to the optical device encouraged its widespread adoption, in the end ensuring that “no other form of representation in the nineteenth century had so conflated the real with the optical”14 as the stereoscope. As the historical introduction above shows, attempts to create devices and technologies that an observer can no longer “distinguish whether or not what he sees is real or an optical illusion,”22 have been going on for the better part of the last two hundred years. These attempts continued in the 21st century as well, as the case of 3DTV explored in this article clearly indicates. During the spring of 2009, as part of my graduate course-related research about the university laboratories and how science is produced within them, I visited Dr. Aydin Alatan, associate professor in the Department of Electrical and Electronics Engineering of the Middle East Technical University in Ankara, Turkey. Dr. Alatan and his laboratory team were one of the 19 entities that comprised the 3DTV consortium, and they were extensively involved in 3DTV research. Their main aim was to create a computer system that could add the sense of depth to ordinary two-dimensional videos without the need to wear special 3D glasses, to be later used in the “off-line conversion of existing 2-D media into 3-D, which will help to overcome the current 3-D content shortage.”26 For this purpose, the team had developed sophisticated software that through the automated determination of camera calibration parameters was able to segment the footage of ordinary 2D video sequences into the background (still imagery) and the foreground (moving objects). By adjusting the distance between these two segments, the program added an artificial sense of depth, thus creating an illusion of 3D. To emphasize the effect even more, these manipulated videos were displayed on a Philips 3D series LCD monitor, then newly introduced to the commercial market. METU researchers explained that they were attempting to address the problem, yet even they were not optimistic about the issue. According to their evaluation, the main problem was caused by the lack of dramatic improvements in the hardware section of 3D systems. If the computer processors and graphics cards were accelerated quickly enough to more realistically trick the human vision system, the continuous 3D motion effect could be flawlessly achieved without visual disturbances when the spectator’s head moved. 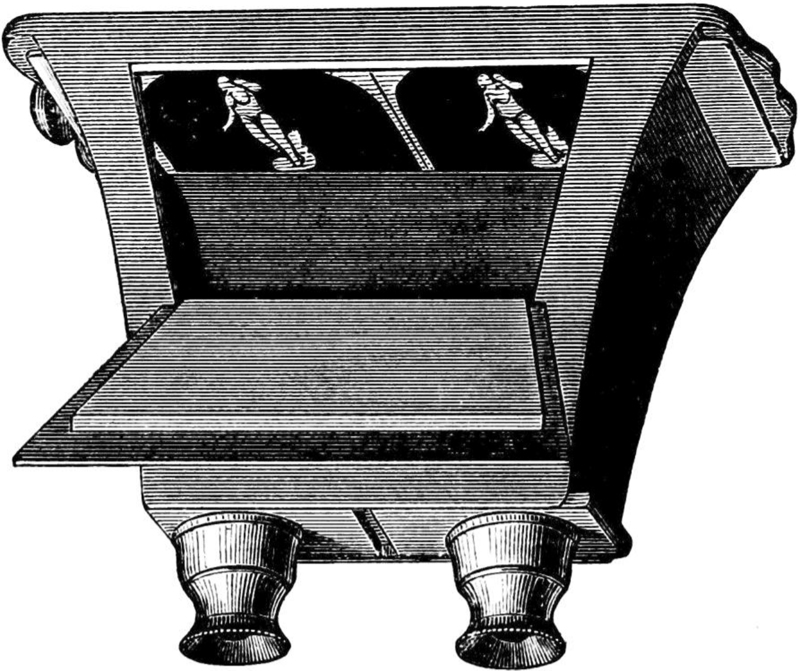 Yet it appears that this problem is at the physiological level given that all the way back in the 1860s, the early stereoscope observers also complained about “weariness of the eye.”28 The issue is related to the biological fact that whenever we look at a real-life three-dimensional object, our eyes simultaneously perform two tasks. First, they verge, that is, rotate “slightly inward or outward so that the projection of an image is always in the centre of both retinas.” Secondly, they accommodate; that is, they change the “shape of each lens to focus the image on the retinas,”29 with the end result being that without appropriate convergence, we would see double, and without appropriate accommodation, our vision would be blurry. Thus, in a way, the entire aim of the carefully designed ‘trickery’ of the human binocular system through an artificially added sense of depth to the cinema screen or the traditional television set — apparatuses that by their own nature are two-dimensional — may have been misguided. This point is raised even by the 3DTV researchers themselves in that they highlight that “stereoscopic 3-D, whether more conventional as in stereoscopic cinema, or more modern as in autostereoscopic monitor viewing, will never yield the ultimate experience.”37 But if stereoscopy-based 3DTV was never even believed to be the future of three-dimensional TV viewing, which technology was actually intended instead? Fig. 2 The index page of the 3DTV consortium’s official website. And yet, on numerous occasions, the ongoing research within the 3DTV network was promoted on various media platforms with obvious hints (as Figure 3 also clearly shows) at this ultra-futuristic mode of visual communication by the 3DTV consortium’s researchers themselves. How, then, can we understand the discrepancy between the intended and the actually conducted research? Where should we place the paradox that the same website that was issuing public warnings to lower the futuristic expectations from the project was at the same time constantly using images that boosted these sci-fi expectations manifold? Fig. 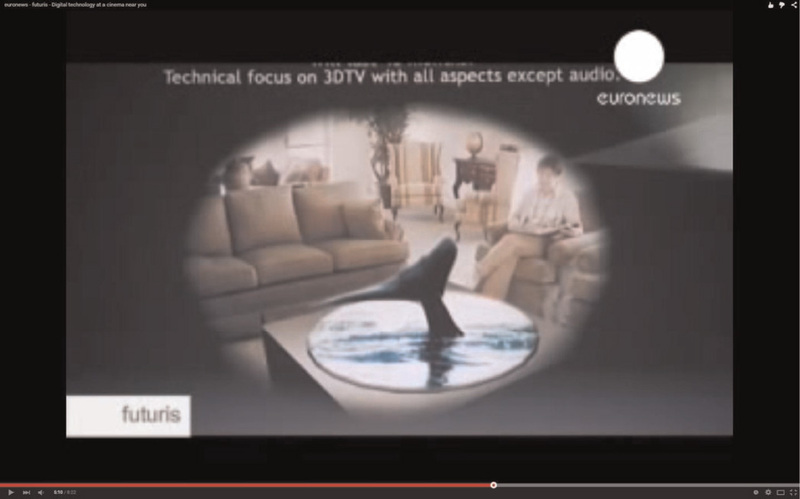 3 Representational image of holographic 3DTV, as presented by the 3DTV network researchers in a Futuris/Euronews video. Watch the full video here. None of the final deliverables of the 3DTV network, nor the follow-up projects that the consortium incubated, touch even slightly upon the subject of holography 3D, despite the fact that on numerous occasions, researchers clearly hinted that a 3D holography television would be the only viable option to overcome the eye fatigue and nausea that were frequently encountered in stereoscopy-based 3D devices, the main reasons for the devices’ commercial failure in the first place. What is happening with 3D devices now is that the huge consumer electronics manufacturers are shifting towards recalibrating traditional television sets with slightly improved capabilities, such as with the newly advertised curved ultra-high definition television set, which was presented to the market as the ultimate immersive experience. Yet even such breakthrough commercial televisual introductions cannot be defined as entirely novel and truly new, owing to the resemblance of these curved televisions to another nineteenth-century mass entertainment medium, the stereorama. Siegfried Zielinski describes in detail one of the most popular stereoramas of its time, the ‘Poetry of the Seas,’ in which the “scene was a large, curved horizon which was turned slowly and thus it afforded different views of the seas and landscapes travelled in the imagination.”51 Such introductions do not bring real novelties to the consumer electronics market; rather, they indicate the increasing commodification of the scientific knowledge that was generated in previous eras and simply re-adapted for the needs of the new one. Ilkin Mehrabov is a PhD candidate in Karlstad University’s Department of Geography, Media and Communication, Sweden. He has a bachelor’s degree in Electrical and Electronics Engineering from Middle East Technical University in Ankara, Turkey and a master’s degree in Media and Cultural Studies from the same university. His doctoral dissertation focuses on the troubled nature of ICT4D discourses, especially in relation to activist media and the meta-processes of mediatization and surveillance. His publications and research interests focus on radical and alternative media, citizen journalism, theorization of surveillance practices, technological change in relation to culture, and the social impacts of ICTs.